The health care industry is in the midst of a period of unprecedented change, creating a complicated and confusing landscape. The shift from fee-based, volume-driven care to value-based, patient-centered care and the growth of specialty pharmaceuticals are propelling us all into uncharted territory, no matter what role you play in health care. Over the past 2 decades, biotech and phar- ma companies have shifted investment away from mass market drug categories toward specialty markets as specialty pharmaceutical approvals have rapidly increased. In 2017, the FDA approved 46 novel drugs, the most approvals in more than 20 years, and specialty medications represented nearly 80% of these approvals. By comparison, only 8 specialty drugs were approved by the FDA in 2008. 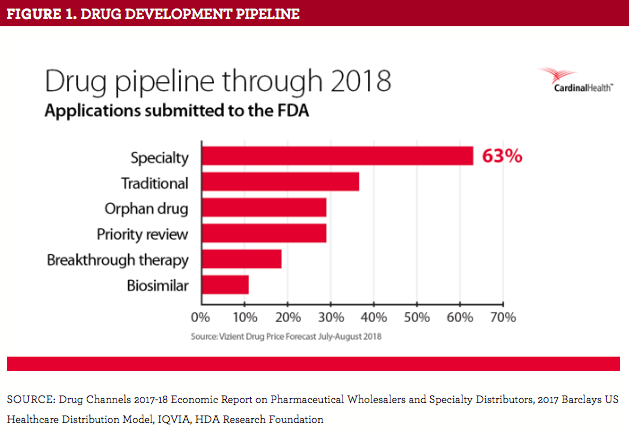 Specialty therapeutics also represent more than 60% of all drugs currently in the development pipeline, according to a Vizient report. Over the next 5 years, more than 100 new specialty drugs are expected to hit the market. By 2022, the specialty market is expected to make up nearly 50% of the total pharmaceutical spend ($248 billion) compared with 21% in 2012 and 34% in 2017 (Figure 1), according to Drug Channels. Within the drug development pipeline (Figure 2), pharma companies are investing heavily in precision therapies for very small, targeted patient populations. Investment in personalized medicines by leading pharma companies has nearly doubled in the last 5 years and is expected to increase 33% over the next 5 years. The industry focus on the development of therapies with smaller patient populations, some of which will be matched precisely to the individual patient, will require new thinking and new approaches to prescribing and patient support. As specialty pharmaceuticals continue to grow, the importance of a competitive cost structure has moved to the forefront for hospital and health-system pharmacy leaders. Sustainable cost control has sur- passed revenue growth as the top priority for hospital CEOs, creating a challenging balancing act between managing both the bottom line and the growing demand for specialty pharmaceuticals, which tend to have less predictable demand than primary care drugs. The one area of the organization well positioned to help identify specialty cost-saving opportunities, boost overall revenue, and improve patient outcomes: the pharmacy. With new drug therapies that are likely to be more targeted and expensive due to limited competition, maximizing efficiencies and identifying savings opportunities in the hospital pharmacy have never been more important. 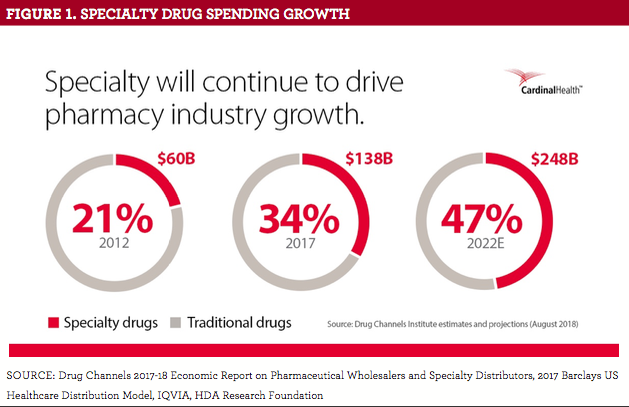 Specialty drugs represent 60% of invoice spending and 2.3% of standard-unit volumes in nonretail settings, according to a IQVIA Institute for Human Data Science report. With a higher invoice cost comes increased inventory carrying costs and greater risk for the pharmacy if the specialty drugs expire. Some medications may also be cold chain products requiring refrigeration, so pharmacies must plan for proper storage to avoid waste. Traditional pharmacy cost-saving strategies that focus on managing the purchase price of drugs may not yield the savings necessary to offset these pressures. Given that the pharmacy’s inventory is its largest investment and represents the majority of its budget, greater inventory control and visibility will be required to manage costs and offset the increasing expenses associated with specialty pharmaceuticals. Hospitals must adopt more sophisticated approaches to streamline and automate inventory management processes for specialty pharmaceuticals, which will only grow more specialized. Traditional manual counting will not be sustainable, and the current ownership model may not be an effective inventory-management strategy going forward. Implementing a cloud-based, RFID-enabled consignment program drives efficiency and helps to automate inventory management. Being powered by a cloud-based platform provides 24/7/365 visibility into inventory that can be accessed from anywhere and across multiple locations. RFID technology automatically updates inventory counts, saving valuable time and resources and eliminating manual counting errors. Additionally, a refrigerated RFID-enabled cabinet helps to maintain product integrity for specialty pharmaceuticals with unique handling and storage requirements. A refrigerated system also ensures that products are kept at a consistent temperature and sends automatic alerts when a shift in temperature occurs. In a consignment model, the financial burden is transferred to the distributor and health systems only pay for the products that they use, which helps minimize risk and account for high-cost–variable demand products. Additionally, the budget previously allocated to higher inventory carrying cost can be reallocated to other initiatives. Consignment also allows hospitals and health systems to keep specialty products on hand so they’re available whenever patients need them. This reduces additional costs associated with emergency shipments and helps the hospital avoid transferring patients to other facilities. To achieve meaningful results, the pharmacy’s strategies to optimize specialty pharmaceuticals must encom- pass a comprehensive approach to controlling all drug costs. This includes overall inventory management strategies, disciplined purchasing practices, and drug-use management and analytics. Strategic and ongoing measurement of key metrics, analysis of spend, and comparison with both internal and external benchmarks are needed to offset drug cost increases and the projected shifts toward specialty pharmaceuticals. Traditionally, many hospitals have focused on price to control drug costs; however, in this new environment, managing drug utilization will be critical. In particular, identifying a hospital’s top medication cost drivers and benchmarking the performances of both drug purchases and utilization will rapidly identify those clinical programs that represent the greatest opportunity for savings. Data should be analyzed by drug, physician, diagnosis-related group, and more. This enables the hospital pharmacy to identify and implement best practices by analyzing prescribing patterns and effectively drive cost reductions. In addition to a continual analysis of drug expenditures and utilization data, sustainable cost savings can be achieved by leveraging programs, such as manufacturers’ patient assistance programs (PAPs), for those who qualify. Among the myriad financial pressures currently facing hospital pharmacies, many of them are more challenged than ever when it comes to providing care to the growing number of underinsured patients in their communities. PAPs can help qualified patients get access to medications and medical devices at little to no cost. In addition to generating savings, PAPs also help increase medication adherence, which in turn helps to reduce unnecessary readmissions. Managing a comprehensive effort to control drug costs requires resources and support, but hospital pharmacies are often already overtaxed in their responsibilities. Given the pressures and demands on hospital pharmacy leaders today, partnering with a knowledgeable third-party vendor may provide the expertise and resources needed for an effective cost-control strategy. In addition to helping uncover hidden savings, the additional support offered by a third-party vendor allows hospital pharmacies to realize a quicker speed to impact and redeploy their staff to focus on more patient-centered efforts. Pharmacies are experiencing unprecedented challenges to reduce and contain overall drug spend. Single-strategy approaches to cost savings do not realize meaningful results. A systematic approach that helps reduce drug costs for hospitals by focusing on both price and utilization, as well as optimizing the management of the growing specialty pharmaceutical spend, is needed to sustain cost control efforts.